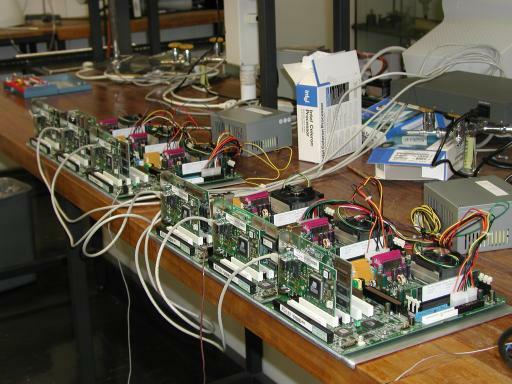 The idea behind our 24-node Celeron cluster was to build a system that maximizes performance/cost for the type of calculations we are mainly engaged in (quantum Monte Carlo with the stochastic series expansion algorithm). After testing several AMD Athlon-XP, AMD Duron, and Intel Celeron (Tualatin) processor/motherboard configurations, we concluded that the Intel Celeron was the fastest solution for our large-memory applications (Athlon XP was faster for our small-memory jobs) and also cheaper than the Athlon XP (the somewhat lower price of the AMD Duron did not make up for its significantly lower performance). In addition, the Celeron consumes much less power, which was also a concern since the lab space where our clusters (the 44-node Pentium III cluster as well as this newer one) are installed is not air-conditioned. The reason for not chosing the newer-type Celeron or Pentium IV was a combination of processor/motherboard prices, no availability of motherboards for standard SDRAM memory, and much higher power consumption. A node consists of an MSI 694T motherboard, an Intel Celeron (Tualatin, 1.2 GHz) processor, 512 MB of SDRAM (a single DIMM), a 3COM (XL3C905C-TX) network adapter, and a graphics card. In principle we would not have liked to include a graphics card, but unfortunately this motherboard doesn't boot without one. The solution was to collect (for free) a bunch of old spare graphics cards from various departments and persons at Åbo Akademi. There are no disk drives for the individual nodes; the boot code is programmed into the network card. Three nodes are mounted side-by-side on an aluminum plate and share a single power supply. 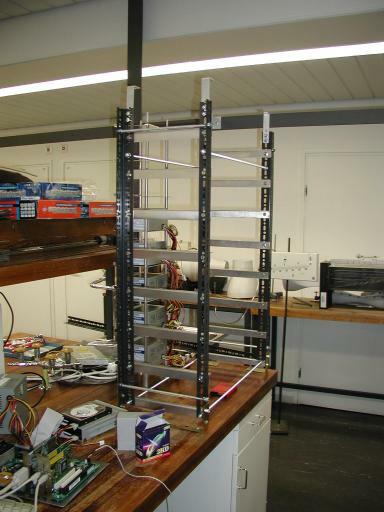 The eight 3-node units are stacked in a home-made rack. The switch (SMC EZ1024DT3 EU, 10/100 TX) and the disk drives for the master node are mounted on top of the rack. This system was planned and designed by Anders Sandvik and Kjell-Mikael Källman. It was built and configured by Kjell-Mikael Källman, with some help with parts for the rack from Tom Wickström at the physics machine shop. It was financed in part by a grant from the Research Institute at Åbo Akademi. The total cost of the system, not including taxes or our own labor, was approximately 6500 EUR (the components were purchased in October 2002). 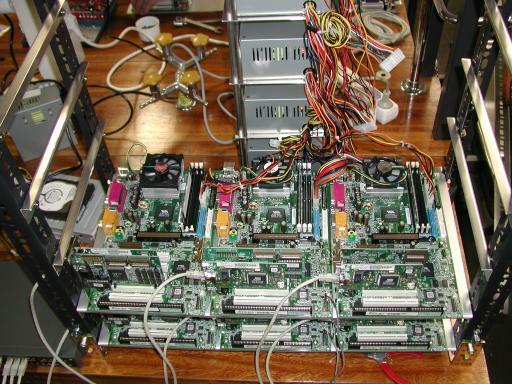 Here two of the 3-node units are seen as they are being configured and tested before installation in the rack. The original power leads of the standard 300W ATX power supply were sufficient for supplying three motherboards. We only had to install two new motherboard connectors, replacing several of the original small connectors. 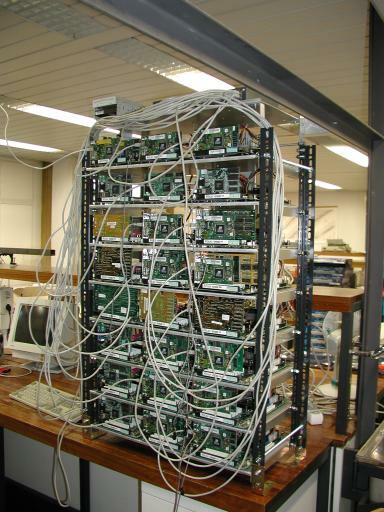 This is the rack before the compute units have been installed. 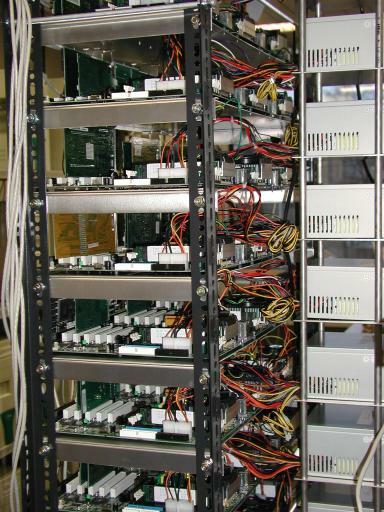 The power supplies are mounted on a separate tower behind the rack. Here five out of the eight power supplies have been mounted in the tower. 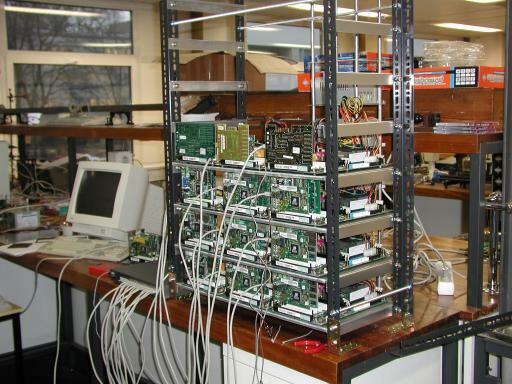 In the low-left corner the master node can be seen as it was set up during the construction and testing of the individual nodes and 3-node units. Here two of the compute units have been installed in the rack. The switch can be seen in the low-left corner. At this point, the incomplete system was already busy doing quantum Monte Carlo simulations. Here four out of the eight units have been installed. The first three layers have PCI network cards, whereas the fourth layer has older (and uglier...) ISA cards. This is the full system with the switch, a hard disk drive, and a floppy drive mounted on the top shelf of the rack. The dimensions (excluding the power tower) are: 70 cm wide, 115 cm tall, 30 cm deep. Here the power supplies and leads can be seen in more detail. The tower is made up out of four rods, with metal tube segments used to keep the support plates at an appropriate distance from each other. 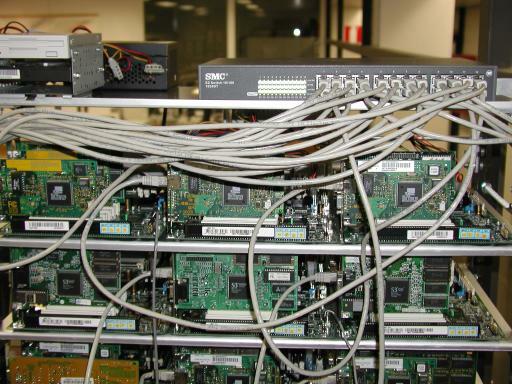 This shows the SMC ethernet switch and the disk drives (40 GB hard disk and floppy) for the master node. The disk drives have their own small power supply; the black box in the back.